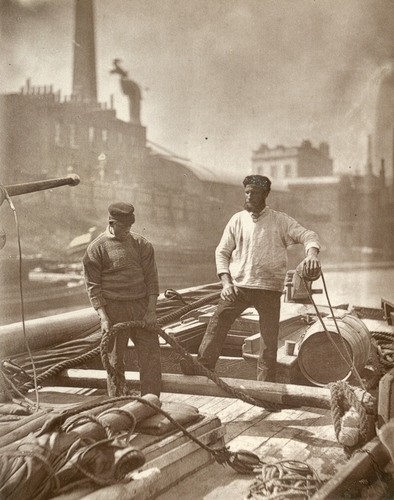 Workers On The "Silent Highway"
"There are, undoubtedly, many most honest, hard-working, and in every sense worthy men, who hold licences from the Watermen's Company, or from the Thames Conservancy. That these men are rough and but poorly educated is a natural consequence of their calling. Never stationary in anyone place, it is difficult for them to secure education for their children, and regular attendance at school would be impossible unless the child left its parents altogether. Thus there is an enormous percentage of men who cannot read at all. Their domestic arrangements are, however, better than the canal bargemen. Cramped up in little cabins, the scenes of over-crowding enacted on board canal barges, equal and even exceed in their horrors what occurs in the worse rookeries of London. Fortunately, the very nature of their occupation compels the men to enjoy plenty of fresh air and invigorating exercise, and this naturally counteracts the evil effects resulting from their occasional confinement in cabins unfit for human habitation."